The first true loft building in Oslo, Jens Bjelkes Gate 71 brings contemporary lifestyles to a neighborhood of traditional apartments. The scale of the building, local materials, and an abundance of glass on the exterior reflect nearby vegetation and buildings and blend into the surrounding environment. 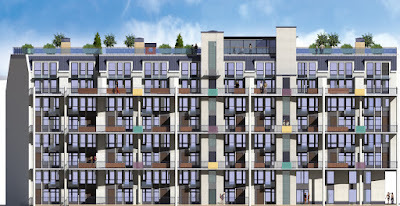 The design encourages community by grouping entrances, generously-sized private balconies, and vertical cores together at the rear of the building. 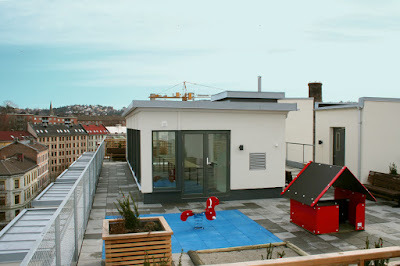 The rooftop is devoted to common space, with an enclosed penthouse for gatherings, a playground, and landscaping that complements spectacular views across Oslo.